A key component of Verisys is the central administration console, which allows you to configure and control all of the Verisys Agents deployed across your enterprise. The central Verisys Console simplifies the management of distributed Agent deployments and enables centralised integrity checks, reporting and licensing administration. The deployed Verisys Agents examine a large number of properties and attributes of each file, as well as utilising strong cryptography, to ascertain whether any changes have been made. You can change the properties that are scanned for each file, group files together and schedule integrity checks to run unattended. By using the reporting and alerting tools, Verisys will automatically send an email to alert key personnel of unauthorised changes, write to the windows event log, send events to syslog, run an arbitrary command or generate a discrepancy report. File integrity monitoring is an important aspect of a proactive company IT policy, auditing and achieving regulatory compliance (such as PCI DSS or SOX). Key to compliance measures is your systems achieving a known and trusted state - and being able to demonstrate that your systems maintain this state. Verisys File Integrity Monitor provides a simple solution to your compliance requirements, giving you confidence that the integrity of your business data has not been compromised. Verisys is licensed based on the number of Agents you deploy to monitor servers or workstations – no license is required for the Verisys Console. Each license entitles you to deploy one Verisys Agent to a single server or workstation. In order to use the Verisys Console to manage deployed Verisys Agents you will need to install license files in the Console. This a simple process and is detailed here. If you lose your license files please contact [email protected] with your company details and purchase information and we can supply you with replacements. Additional licenses can be purchased at https://www.ionx.co.uk. In order to install the Verisys Console or the Verisys Agent you will require a Verisys certificate, which you will receive when you purchase Verisys. The same certificate must be installed to the Verisys Console and Agents, as it is used to secure communications between the Console and Agents. If you lose your Verisys certificate please contact [email protected] with your company details and purchase information and we can supply you with a new certificate. Enterprises will typically have invested in processes and tools for large-scale configuration management (such as Microsoft SCCM, Ansible, Puppet, Chef or SaltStack) and log management (such as a SIEM, or Splunk). 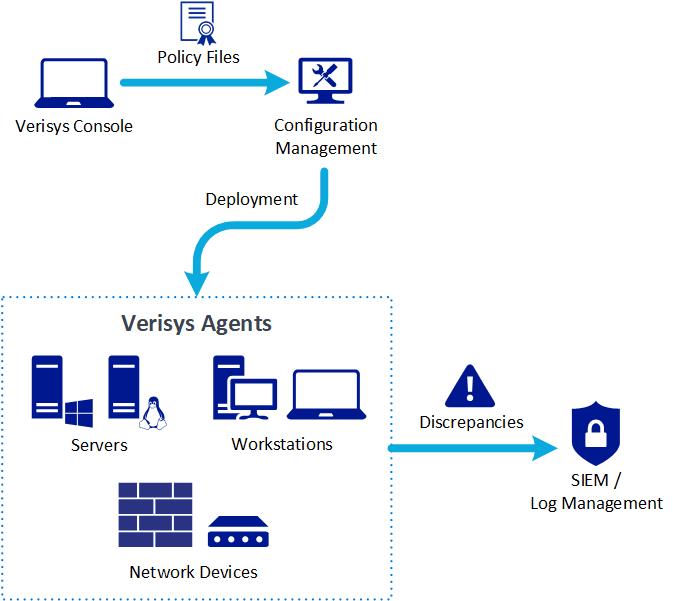 For large enterprise deployments, we recommend you operate Verisys Agents in offline mode, which allows you to deploy Agent configuration using your enterprise-standard processes and tools, while also strengthening your security posture. In offline mode, Agents do not listen for incoming connections from the Verisys Console, and configuration is not pushed to Agents from the Verisys Console - instead, you create and configure Agent Templates in the Console, and export them as Policy Files. You can then deploy Verisys Agents, along with your Policy Files, using your configuration management system. When Verisys Agents discover changes, they can send details of those discrepancies to your enterprise-standard SIEM, log management system or Splunk, by using the standard syslog protocol. 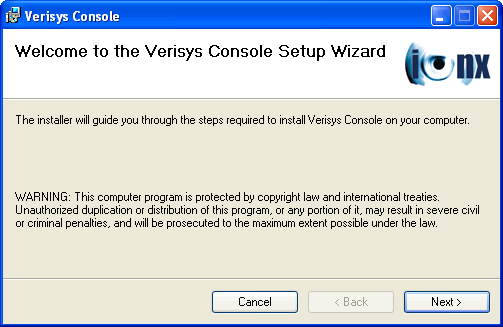 The Verisys Console and Agent require Microsoft .NET Framework 4.0, 4.5, 4.6 or 4.7 when installed on Microsoft Windows. Please note that Verisys Console is not supported on Linux systems. During installation you will be prompted to select reports database options. The reports database is used to store discrepancy reports that have been gathered from deployed Agents. You can select SQLite (which requires no further configuration), or advanced users can select Microsoft SQL Server. SQLite is recommended for small deployments (1-20 Agents), while Microsoft SQL Server is recommended for larger deployments (20-100 Agents), where you have an existing installation of Microsoft SQL Server. For enterprise-scale deployments (100+ Agents), we recommend running your Agents in offline mode, and sending all discrepancy data to your SIEM, log management system or Splunk, so you should leave this setting at the default of SQLite. If using Microsoft SQL Server you will need to provide connection details so the Verisys Console can communicate with the database server. You will also need to specify the name of a database that Verisys will use to store discrepancy reports – for new installations this must be an empty database, but if you are upgrading an existing Verisys Console installation you should supply the name of your existing database. The credentials used must have db_owner access to the database. You may need to contact your Database Administrator if you do not have this information. Unless you are operating your Agents in offline mode, by default the Verisys Console communicates with deployed Agents using TCP port 3313. Note that on Windows systems you can change the port Agents listen on using the Verisys Agent Configuration Utility, which is installed with the Verisys Agent. On Linux systems it can be changed by editing the file /opt/ionx/verisys-agent/etc/verisys-agent.conf and then restarting the verisys-agent service. When monitoring network devices, network device Rules are assigned to Agents that perform the integrity checks. The Agents must be able to communicate with the network devices on the appropriate TCP port (e.g. 23 for Telnet, 22 for SSH/SCP/SFTP). A baseline snapshot of the current system state is taken and according to your configuration Verisys will automatically compare the system against this baseline to detect any changes. Using the Console, you can also start an integrity check manually at any time. Verisys Agents examine a large number of properties and attributes of each file to ascertain whether any changes have been made. Rather than simply check basic object properties, Verisys performs a complex cryptographic hashing algorithm on the actual data contained within each file - if files are altered in any way, Verisys will detect it. Using the Verisys Console, Agents can be configured to monitor specific files or groups of files using wildcards, and can recurse through a directory structure. You may have different monitoring requirements for some objects (for example you may wish log files to be able to grow, but want to detect any alterations to previously logged data). Verisys accordingly allows to you configure different monitoring levels to give you control over what properties are observed. In your environment some system objects may be more critical than others, so Verisys allows you to set a priority for each monitoring Rule, enabling different actions to be taken automatically. Operating system and application templates for common system configurations are included to help you get started. A key component of Verisys is the central administration console, which allows you to configure and control all of the Verisys Agents deployed across your organisation. The central console simplifies the management of distributed Agent deployments and enables centralised integrity checks, reporting and licensing administration. Jobs and Rulesets can be configured and published to remote Agents using the Verisys Console, reducing rollout time and simplifying the implementation of compliance procedures. Alternatively, Verisys also allows enterprises using configuration management tools (such as Microsoft SCCM, Ansible, Puppet, Chef or SaltStack) to leverage their existing investment, deploying and configure Verisys Agents using their enterprise-standard processes and tools. 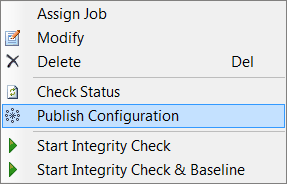 Automated integrity checks can be scheduled from the Verisys Console including the ability to configure responsive actions to take once an integrity check has identified discrepancies. Integrity checks can also be initiated on an ad-hoc basis, giving you complete control over the integrity of your workstations, servers and network devices. The Verisys Console also provides a central point for all your reporting requirements. Using the intuitive interface you can generate reports in a number of formats based on your desired search criteria. 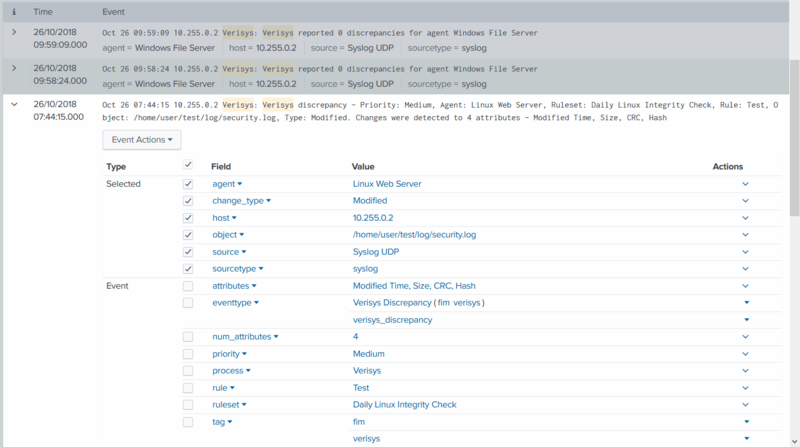 Agents are deployed to servers and workstations to monitor file integrity, and can be configured and managed from the central administration console. Normally the Console will be installed on an administrator’s workstation, while the Agent is installed to servers and workstations to be monitored, but you can also install both the Console and an Agent to a single machine if desired. Each Agent is assigned Jobs that define when automated integrity checks should be carried out, and the actions to take when discrepancies are detected. Rulesets are assigned to Jobs to specify the objects to be monitored. 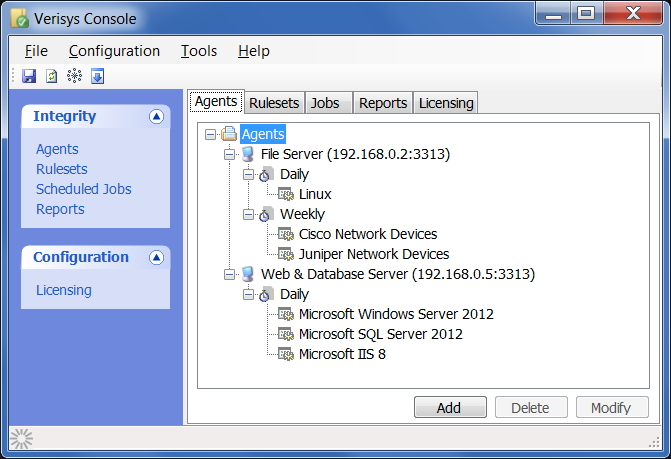 Agents can be configured to run in offline mode, in which they do not listen for incoming connections from the Verisys Console. In this mode of operation, instead of pushing configuration to Agents from the Verisys Console, Policy Files are exported from the Console for deployment using your enterprise-standard configuration management processes and tools (such as Microsoft SCCM, Ansible, Puppet, Chef or SaltStack). Offline mode is primarily recommended for use in large-scale deployments by enterprises with an existing investment in configuration management systems. As no network connection is required, offline mode is also valuable in high-security, air-gapped environments. 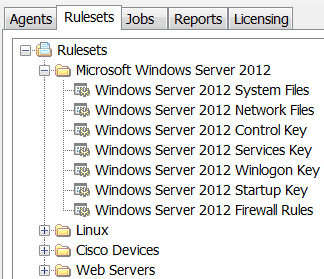 Rulesets are used to group together Rules that define what files, registry keys and network devices are to be monitored. For example, you can create a Ruleset for Windows Server 2016 and apply it to all of your Windows Server 2016 servers in a single step. You can create your own custom Rulesets, or use the templates supplied with Verisys to get started quickly. Rules define the files, registry keys and network devices to be monitored, and are contained within Rulesets. Some objects may be more critical than others, so you can set a priority for each Rule. The priority will appear on reports and can also optionally be used as a threshold to conditionally perform actions. 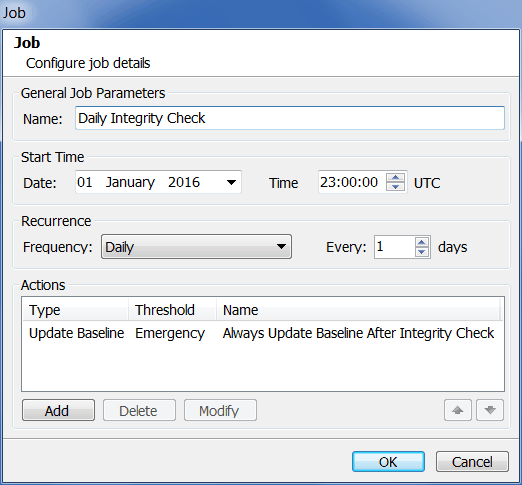 Jobs are used to schedule automated integrity checks so you can protect your systems without manual intervention. For example, you can specify that all of your file servers should run an integrity check once a day, and all of your payment processing servers should run an integrity check once every 2 hours. For more information about scheduled jobs, see the section Jobs. 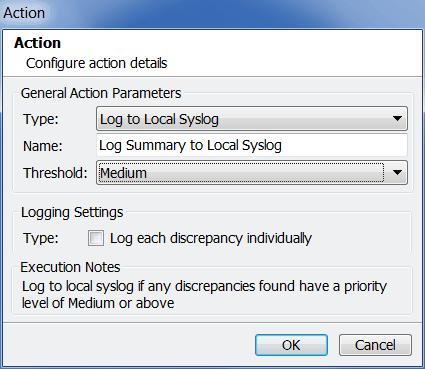 Actions specify actions to be taken after running an automated integrity check. For example, you can specify that a discrepancy report should be emailed to an administrator or sent to a syslog server. 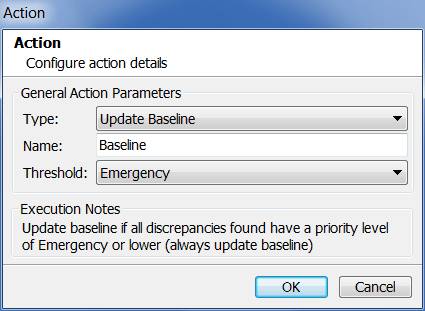 An action can also be used to automatically update the baseline after performing an integrity check. You can optionally state that one or more actions are only to be taken if discrepancies over a specified priority threshold are detected – for example, you may only wish to email an administrator if high priority discrepancies are detected. For more information on actions, see the section Actions. An Agent Template represents an Agent configuration that will be exported as a Policy File and deployed to Agents running in offline mode. An Agent Template can be exported as a Policy File, and deploted to Agents running in offline mode. Policy Files can be deployed during the initial installation of the Agent. If you later update an Agent Template, you can be deploy a new version of the Policy File. After deploying a new version of a Policy File, the Verisys Agent service must be restarted for it to take effect. From the Licensing page you can manage Verisys Agent licenses. You must install one or more valid license files before you can manage any Agents from the Console. When you purchase licenses from Ionx you will receive a license file to install in the Console. 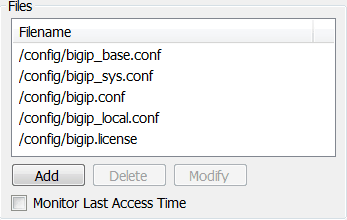 You can use the Add button to browse for new license files to install. 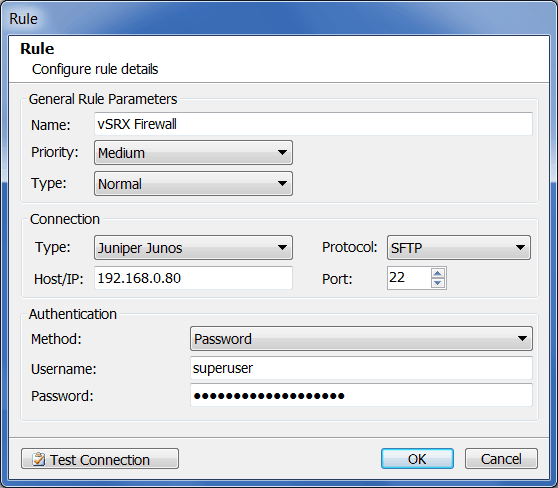 1 Verisys license is required for each unique IP/hostname monitored by network device Rules. After installing the Verisys Agent to a remote server or workstation you can manage it through the Verisys Console. After modifying or assigning Rules, Rulesets or Scheduled Jobs, a small out of sync image will be displayed beside any affected Agents. In order for Agents to receive the updated configuration you must publish it to them. Before you can publish the configuration you must save it using the save button on the toolbar. Once the configuration has been saved you can publish it to all Agents using the publish button on the toolbar. From the Agents page you can configure Agent Templates, which can then be exported as Policy Files for deployment to Agents running in offline mode. You can create a new Agent Template by right-clicking on the root Agents node in the list of Agents and selecting New Agent Template from the popup menu. You can modify an existing Agent by double-clicking on it, or by right-clicking on it and selecting Modify from the popup menu. A descriptive name for the template, e.g. "Windows Web Servers", "Windows 10 Desktops", "Linux Database Servers". The number of Agents that you wish to deploy the template to - 1 license is required for each Agent. You are responsible for ensuring that this value is accurate, for increasing it when you require to deploy new Agents, and for ensuring that your organisation has purchased enough licenses for all of your deployed Agents. Verisys ships with a number of template Rulesets for common system configurations. For example, there are template Rulesets for Microsoft Windows Server 2008 and Microsoft SQL Server 2008. Using template Rulesets can help you quickly start monitoring file integrity, but of course you are free to make changes or create your own Rulesets from scratch. When creating a Ruleset, you will be asked to set the type to either Windows or Linux/Unix. You should select the appropriate type for your Agents. The following sections detail each of the different types of Rule. 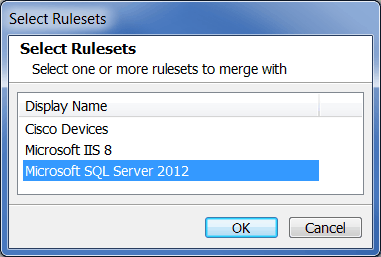 You can merge two or more Rulesets into a single Ruleset – for example, if you have a Windows 2012 server that is running Microsoft SQL Server 2012, you can load the Ruleset templates for Microsoft Windows Server 2012 and Microsoft SQL Server 2012, and then merge them into a single Ruleset that can be assigned to the Agent running on that server. You will then be prompted to enter a name for the new Ruleset. After supplying this, the new Ruleset will be created, and will be visible in the tree. These fields are optionally used to state which files and folders within the specified Path are to be monitored. Asterisk ‘’* can be used as a wildcard, and you can separate multiple filters using a semicolon ‘;’. In the example above we can see that .exe, .com, .dll, .drv and .sys files are being monitored in the C:\Windows directory. The Recurse option is selected, so Verisys will recurse down the folder structure monitoring matching files, but the Exclude rule specified above will prevent Verisys from monitoring the Temp folder. Note the Exclude rule in the example contains a directory separator (backslash) - Verisys matches the inclusion and exclusion filters against the full path, rather than just the filename. You can manually enter the path, or use the browse button to locate it. Network device Rules are assigned to the Agents that are to execute them - those Agents must therefore be able to communicate with the target network devices, so changes to your firewall configuration may be required. Verisys ships with presets for various network devices, including Cisco, Juniper, Palo Alto and F5. You can also use the Custom connection type to connect to any network device that supports Telnet, SSH, SCP or SFTP. After configuring connection details, you can use Test Connection to check that you are able to connect to the device with the specified credentials. The Protocol dropdown will contain all valid protocols for the selected Connection Type. While Telnet may be available for some Connection Types, it is recommended to use one of the secure protocols, SSH, SCP or SFTP. 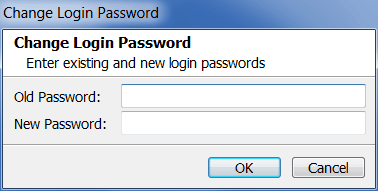 Both Password and Public Key authentication are available, depending on the selected Protocol. When using Public Key authentication, private keys in both OpenSSH and ssh.com format are supported. The Validate button can be used to parse your script to check the syntax is correct. The Full Screen button will pop out a text editor into a new, full screen window. Scripts are defined VISL (Verisys Interactive Script Language), which is similar to expect. More details can be found in the following section. VISL (Verisys Interactive Script Language) allows you to define scripts to interact with text-based protocols such as Telnet and SSH. The goal is to capture responses from network devices as one or more named results to be monitored for changes. 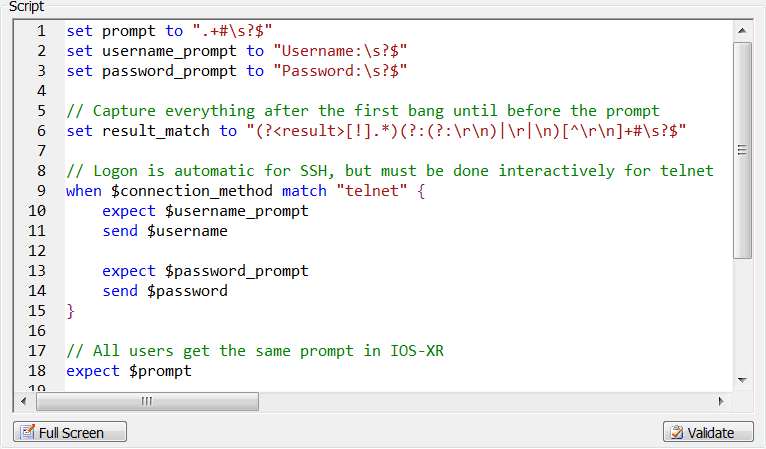 For example, on a Cisco IOS device you would capture the response to the show startup-config command as a result. In general, the pattern used in VISL scripts is to send a command, and then expect a particular response, which can be captured as a result. The available commands are described below, and complete examples can be found in Appendix B. The send command is used to send a command to the server. The command should be either a quoted string or a variable that contains the command to be sent. The expect command waits until pattern is matched in the response received from the server, or the timeout is reached. 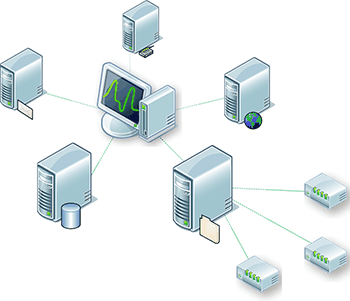 The result command is used to create a result to be monitored from the previous server response. Pattern must be a regular expression, or a variable containing one. A named capture group called result can be used in the regular expression, otherwise all matching characters will be used. The when command is used to enter a conditional block (curly braces are used to open and close the block), where the contents of the block are only executed if the value matches the pattern (or does not match when not is used). Named variables are used to store values for use in the script, particularly where you may wish to reuse the same value several times in a script. Some variable names are reserved for use by Verisys. While their value cannot be changed, you can use them in VISL scripts. Jobs are used to group Rulesets together for execution at schedule intervals, so you can protect your systems without manual intervention. For example, you can specify that all of your file servers should run an integrity check once a day, and all of your payment processing servers should run an integrity check once every 2 hours. Jobs can be assigned to Agents from the Agents page. The date and time that the automated integrity check should be performed at. Never (the job will never be started automatically and can only be executed manually in the Console, or by a scripted integrity check. When selecting Minutes, Hourly or Daily, a control will be displayed to allow you to choose the interval at which the scheduled job should run. For example, you can specify that a scheduled job should run every 6 hours. The Actions list is used to specify one or more actions to be taken after running an automated integrity check. By default an action is added to automatically update the baseline after automated integrity checks – this ensures that discrepancies noted on previous integrity checks are not reported on subsequent checks. If this is not the behaviour you want, this action may be deleted. More information on actions can be found in the following section. Post-job actions allow you to specify one or more actions to be taken after running an automated integrity check. 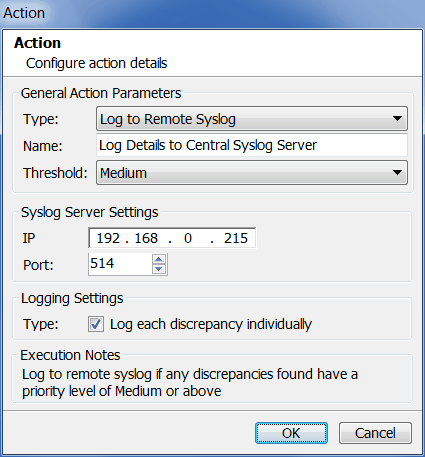 For example, you can specify that a discrepancy report should be emailed to an administrator or sent to a syslog server. 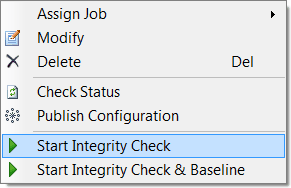 A post-job action can also be used to automatically update the baseline after performing an integrity check. By default such a post-job action is added, ensuring that discrepancies noted on previous integrity checks are not reported on subsequent checks. If this is not the behaviour you want, this post-job action may be deleted. You can optionally state that one of more actions are only to be taken if discrepancies meeting a specified priority threshold are detected – for example, you may only wish to email an administrator if high priority discrepancies are detected. The Add, Delete and Modify buttons can be used to work with post-job actions. This is a name of your choosing that will be displayed in the Verisys Console. Allows you to specify the conditions under which a post-job action will be executed. In the example above it is set to Low, so the post-job action will run if any discrepancies with at least this priority are detected. When it is set to None (the default), the post-job action will be executed even if no discrepancies are detected. 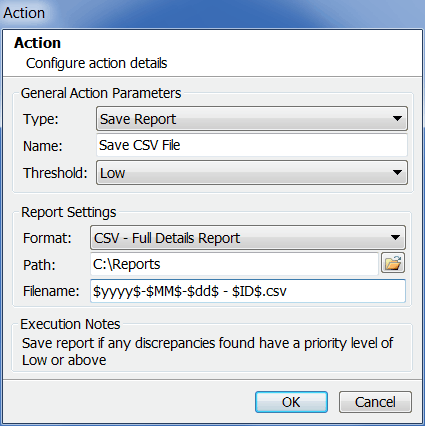 Specifies which filename the report should be saved to within the Path. A fixed filename can be entered, or you can use variables to instruct Verisys to generate a filename (as can be seen in the above image). A table containing all valid variables can be found in Appendix A. 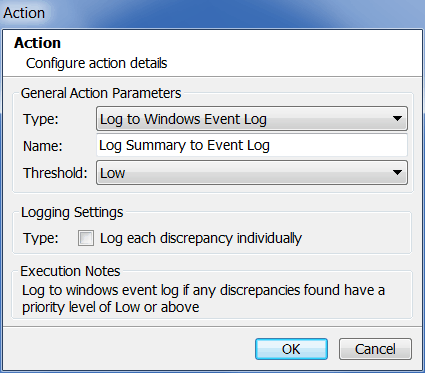 If Type is checked each individual discrepancy will be logged as a separate event log entry, otherwise a single event log entry containing a summary will be logged. The Send Email action is used to send an email containing discrepancy information to one or more recipients after a scheduled integrity check has been performed. 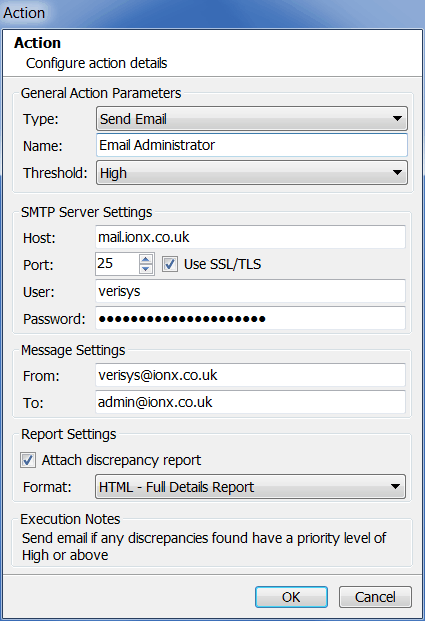 An SMTP server is required to send emails. Note that emails are sent by the individual Agents, not the Console, so depending on your environment you may need to create firewall rules to allow your Agents to communicate with your SMTP server. The email address to send the email from. Can optionally be used to pass arguments to the command. Static text can be entered, or you can use variables to instruct Verisys to generate arguments (as can be seen in the above image). A table containing all valid variables can be found in Appendix A. 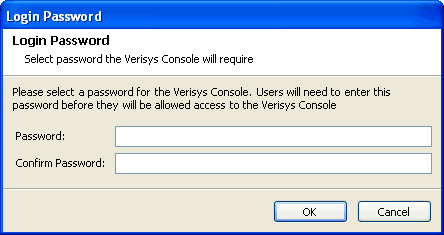 When logged into the Verisys Console, you can change the login password at any time by selecting Change Login Password from the Configuration menu. This will start all jobs on the selected Agents. You can start only a specific job, right-click the job instead of the Agent. Selecting Start Integrity Check & Baseline will cause the selected Agents to perform an integrity check, and then to also force an update of the baseline. When a manual integrity check completes, any actions associated with the Agent will be executed. 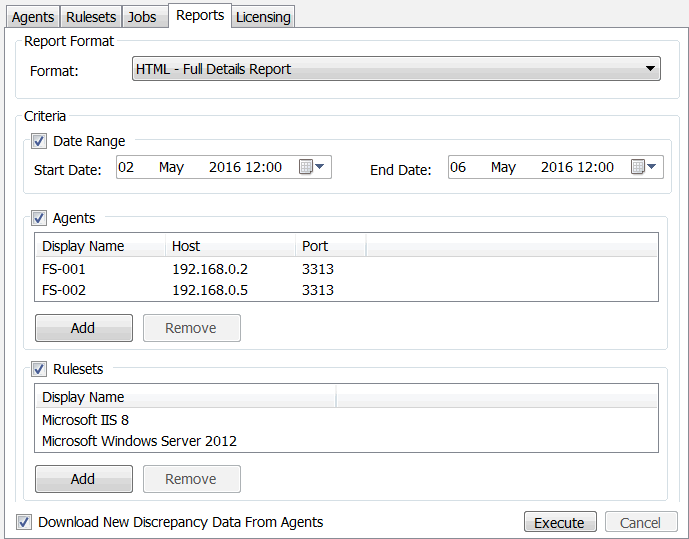 You can download discrepancy reports generated by deployed Verisys Agents to the Verisys Console reports database. Once reports have been downloaded, you can then run reports from the Console, which are based on the discrepancy data downloaded from Agents. To download reports from all Agents, press the download button on the toolbar. By default, Agents retain discrepancy reports for 45 days before they are automatically deleted. You can use the Verisys Agent Configuration Utility to change this if required. When you are ready to run the report, press the Execute button. Select a cut-off date and press the OK button to begin purging the database of old data. 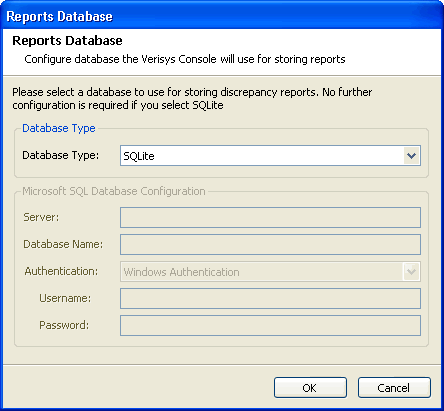 Note that Verisys support the use of either SQLite or Microsoft SQL Server as the reports database. SQLite is recommended for small deployments (1-20 Agents), while Microsoft SQL Server is recommended for larger deployments (20+ Agents) where you have an existing installation of Microsoft SQL Server. 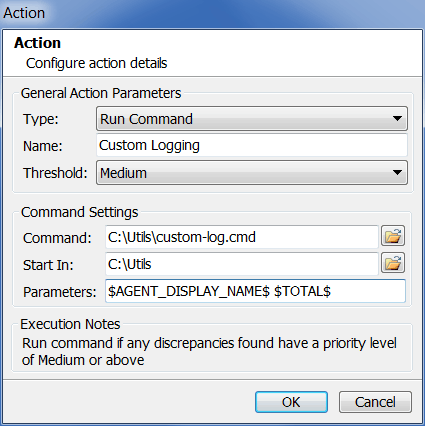 The Verisys Agent Configuration Utility is installed on Windows systems with the Verisys Agent, and can be used to configure Agent parameters. 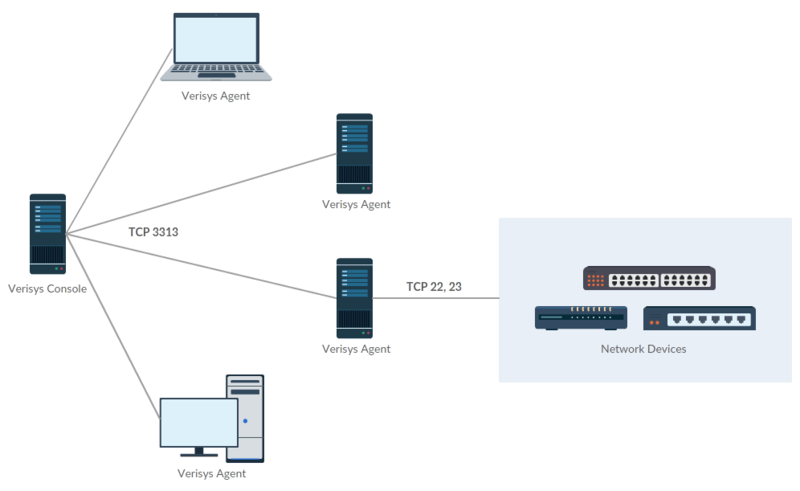 By default the Verisys Agent listens for connections on all available network interfaces (using IP address 0.0.0.0). If required, you can use the Verisys Agent Configuration Utility to listen only on a specific IP address. The Verisys Agent Configuration Utility can also be used to configure the logging level, which determines how much diagnostic information is written to log files during operation. The default value is Info. Because additional logging may adversely affect performance, we recommend this is only changed temporarily if requested by Ionx Support as part of an active support case. If you wish to run the Verisys Agent using an account other than the default (Local System Account), you must ensure that the account has access to the filesystem and registry objects that you wish to monitor, as well as having access to the Verisys installation directory. The account must additionally possess the SeSecurityPrivilege right (which is used to determine filesystem audit details) – this can be granted using the Windows Group Policy tool. multiple instances of the Verisys Console, and you want a convenient way of reusing your custom Rulesets. Note that when you export a Ruleset it will not contain any configurable paths; upon loading the exported Ruleset, it will be loaded with all paths exactly as they were when they were exported. Where NAME OF PATH is the name to be displayed in the Verisys Console when loading the template Ruleset, and DEFAULT PATH is the default path when creating a new Ruleset from the template. msiexec /i "C:\Install\Verisys Console Setup x86.msi" /qn /l*v "Install.log" AUTO=YES PASSWORD="MyPassword" CERTFILE="Verisys.pfx"
Note that when using unattended installation mode, only the zero-configuration SQLite database is supported as the reporting database. msiexec /i "C:\Install\Verisys Agent Setup x86.msi" /qn /l*v "Install.log" AUTO=YES CERTFILE="C:\Install\Verisys.pfx"
On Windows systems it is possible to request that a Verisys Agent performs an ad-hoc integrity check without using the Console. This is accomplished using a command line tool, the Verisys Integrity Check Utility. By default this tool is installed to C:\Program Files\Ionx\Verisys Agent Utility. If your security certificates expire or are compromised, Verisys provides command line utilities to allow replacing them without losing any data. These utilities decrypt Verisys data using your existing certificate, and the re-encrypt it with your new certificate. These tools can be found within the installation folders of the Verisys Console and Agent. Note that they can only be executed by an administrator. What do I do if I forget the Console password? You can purchase additional Agent licenses from the Ionx website. Please contact [email protected] with your company details and purchase information and we can supply you with replacements. Please contact [email protected] with your company details and purchase information and we can supply you with a new certificate. Can I install the Console to multiple machines? Yes, you can install the Console to any number of machines, as long as each Console monitors different Agents (using different Console installations to monitor the same Agents is not supported). You will still need to purchase a separate license for each Agent. We recommend you use a distinct Verisys security certificate for each Console – if you require additional Verisys security certificates, please contact [email protected] with your company details and purchase information and we can supply you with new certificates free of charge. Can I install the Console and Agent on a single machine? Yes, you can install both the Verisys Console and Agent to the same machine. Does Verisys produce any log files? send "show configuration | no-more"
© 2010 Ionx. All rights reserved. This product includes software components licensed under the Apache Software License, version 2.0. The license text is available at http://www.apache.org/licenses/LICENSE-2.0. This product includes the Mono runtime licensed under the GNU Library GPL 2.0. The license text is available at http://www.gnu.org/copyleft/library.html#SEC1. This product includes NHibernate software components, licensed under the LGPL license, version 2.0. The license text is available at http://www.gnu.org/copyleft/lesser.html. This product includes The Saxon XSLT and XQuery Processor software components from Saxonica Limited, licensed under the MPL license, version 1.0. The license text is available at http://www.mozilla.org/MPL/. The Saxonica homepage can be found at http://www.saxonica.com. This product includes NHibernate software components, licensed under the LGPL license. The license text is available at http://www.gnu.org/licenses/lgpl-2.1.html. This product includes IKVM.NET software components, licensed under the zlib license. The license text is available at http://opensource.org/licenses/Zlib. This product includes software components that are copyright © Binarymission Technologies Limited, UK. - Neither the name of James Gregory nor the names of its contributors may be used to endorse or promote products derived from this software without specific prior written permission. This product includes software components written by Mathew Hall, licensed under the BSD license. Copyright (C) 2009 Federico Di Gregorio. NEIL HODGSON DISCLAIMS ALL WARRANTIES WITH REGARD TO THIS SOFTWARE, INCLUDING ALL IMPLIED WARRANTIES OF MERCHANTABILITY AND FITNESS, IN NO EVENT SHALL NEIL HODGSON BE LIABLE FOR ANY SPECIAL, INDIRECT OR CONSEQUENTIAL DAMAGES OR ANY DAMAGES WHATSOEVER RESULTING FROM LOSS OF USE, DATA OR PROFITS, WHETHER IN AN ACTION OF CONTRACT, NEGLIGENCE OR OTHER  TORTIOUS ACTION, ARISING OUT OF OR IN CONNECTION WITH THE USE OR PERFORMANCE OF THIS SOFTWARE.